I don’t want to die. After a very difficult series of jumps and dashes, I was down to my last husk of health. I sat upon the single platform that wouldn’t kill me and felt the magnitude of the situation. With no safety in sight, my next action was critical. Hitting any of these spikes would mean instant death, and even worse, replaying that awful section again and losing progress. 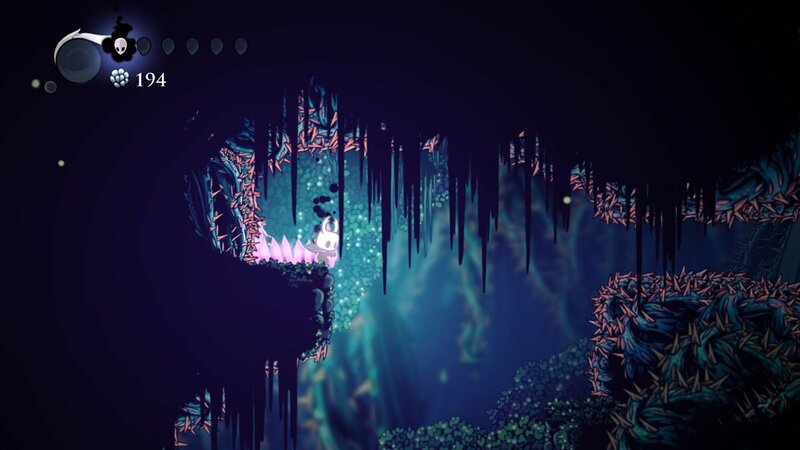 I thought that maybe, after a dozen downward-stab jumps across spiked enemies, the hard part was over and some kind of safe passage or reward would await me here. I was a fool. Curiosity had its way with me once again, and now my only way back was even more dangerous and uncertain than the journey that left me in this state. I braced myself. The way forward was right there through those spikes, and I just had to do a flying dash through it. A regular dash wouldn’t make it. Regular jumps wouldn’t take me far enough. I knew it had to be a flying dash but the problem was, I couldn’t see far enough to see where my landing would be. With no other option, I started charging the dash. “WHOOOOSH!” I let go of my charge and flew across the screen. The spikes grazed my determined little ears as I flew through the gap. Immediately I found myself in a giant room with a hard floor and felt a small dose of relief, thank heaven- NO I’M ABOUT TO HIT A SPIKE WALL! BAIL OUT! I mashed every button in a desperate attempt to break out of my dash and collapsed on solid ground with a thump. What a relief. I’m alive. I didn’t know you could break out of a dash until now, when I absolutely needed to. There was a small hut here, seemingly occupying this space on its lonesome. What kind of creature would live up here? I walked in and immediately felt at ease as a pleasant humming bounced around the room. Inside was an artist named Nailmaster Sheo. He was delighted to have some company and taught me a special nail attack, then blessed me with some warrior wisdom on my way out. Thank you my friend. He said he used to be a warrior but now finds art to be more rewarding, filling up his soul after endless combat had drained it. He seems blissfully unaware of the difficult platforming right outside his house. Or perhaps that’s the very reason he’s stuck here. Regardless, I had claimed my reward from this area and now it was time to return to Dirtmouth. What now? I couldn’t go back the same way because there was no room to cancel a dash in that direction. I still didn’t even know how I cancelled it, and it was too dangerous here to practice. I can figure that out later. I pushed forward through a small gap on the right and managed to scavenge some health from a small enemy. My health situation wasn’t critical anymore. Still bad, but I bought myself some peace of mind and continued on. After a bit of platforming I found a walkway leading in the right direction. I had done a full loop of this area, with the initial trial looming below me. I did not want to go through that again. 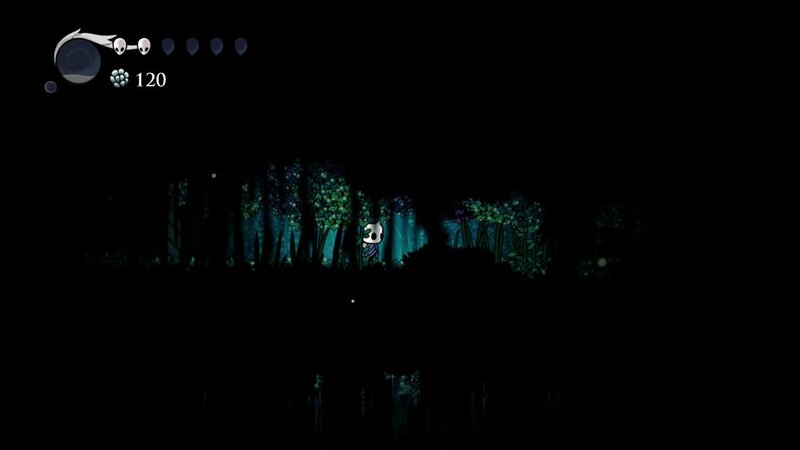 Knowing spiked enemies and traps were below, I walked very slowly and cautiously through the darkness. This space was so small I had to pay close attention to every sound and animation. My health was still low enough that an enemy ambush or spike trap could finish me. Eventually I found a vine I could slice to descend back down to safety. Grass flew everywhere with a satisfying “chttttt“. I was now in the main area of Greenpath and everything started to look familiar again. I had been here enough to remember my way all the way back to Dirtmouth now. Ah, home. Is this my home now? I didn’t have much else. The shared sorrow of this city was oddly comforting and it felt good to sit down next to a friend. At least nothing here wanted to kill me. It felt good to come back with a new ability but perhaps the greatest reward was this feeling of perseverance. As I found myself stuck in spikes a long way from home, my actions meant something. There was something at stake. I got the feeling that my life was important. As I push on towards the unknown, the prospect of even greater challenges is daunting but exciting at the same time. All I can do is stay alive and keep going. 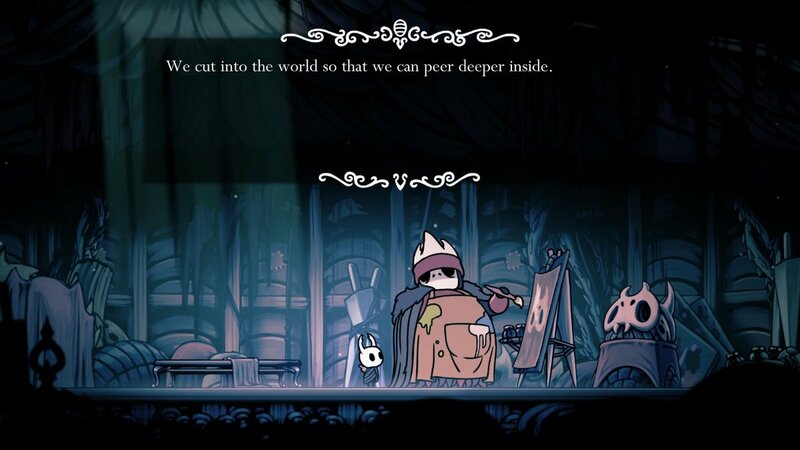 This is a world worth living in. 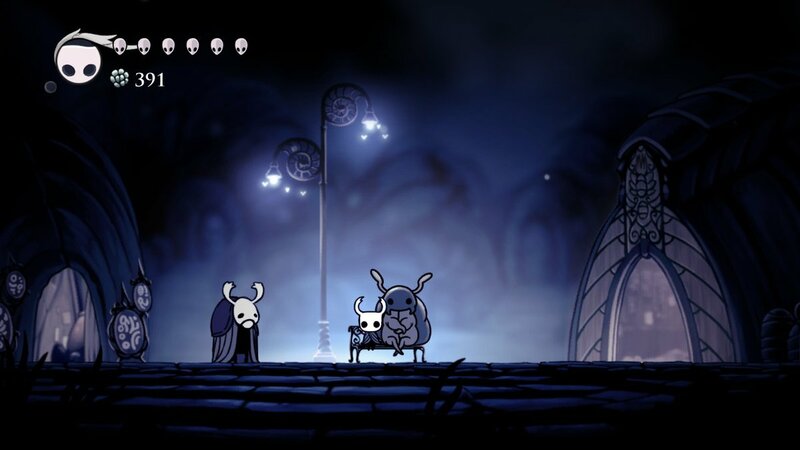 This entry was posted in Uncategorized and tagged Hollow Knight, Nintendo Switch. Bookmark the permalink.